from the Social Security Administration (SSA). 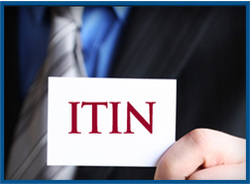 An ITIN does not authorize work in the U.S. or provide eligibility for Social Security benefits or the Earned Income Tax Credit. IRS issues ITINs to foreign nationals and others who have federal tax reporting or filing requirements and do not qualify for SSNs. If you do not have a SSN and are not eligible to obtain a SSN, but you have a requirement to furnish a federal tax identification number or file a federal income tax return, you must apply for an ITIN. All ITINs not used on a federal tax return at least once in the last three years will no longer be valid for use on a tax return as of Jan. 1, 2017. Additionally, all ITINs issued before 2013 will begin expiring, starting with those with middle digits of 78 and 79 (Example: (9XX-78-XXXX). All expired ITINs must be renewed before being used on a U.S. tax return. B. Documentation explaining why you need an ITIN, for example; US NR tax return, original signed letter from withholding agent, purchase contract etc.